I love rice Krispy cakes any time of year, but there’s something very Eastery about them indeed. Make them into a nest and chuck some eggs in the middle and you’ve got the perfect easy to make Easter treat. I wanted to give the traditional version a little twist, and when it comes to desserts I’m pretty sure the ‘less is more’ rule doesn’t apply, so I thought I’d make a big old nest filled with the most indulgent chocolate ganache and decorated with homemade chocolate eggs. I know you know about rocky road, but what if I told you there was an equally as delicious version that comes out around this time of year? Because I don’t know about you, but I love me a little white chocolate version of anything, and these are just sublime. Easter is totally one of my favourite times of year – spring is springing, we get a four day weekend and it’s completely acceptable to eat as much chocolate as physically possible. What’s not to like! I wanted to celebrate this year by creating something a little different, because as much as I love chocolate eggs (and boy do I love them), it’s nice to mix it up sometimes too. We’ve got four days after all! Now these beauties may look and sound pretty fancy, but they’re actually really easy to make. 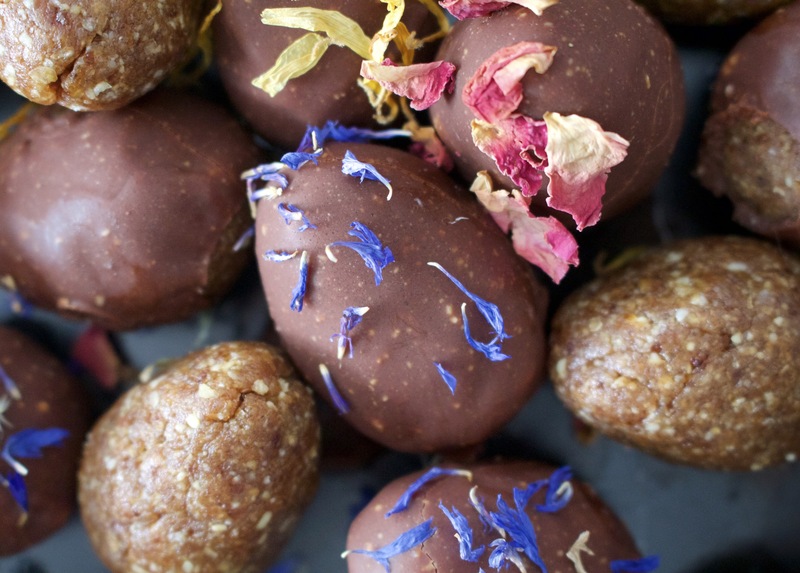 You just need a handful of ingredients, a quick whizz in the food processor, and then a dip or three into the most delicious raw chocolate imaginable. Ok, so you might have heard of double chocolate, or maybe even triple chocolate, but quadruple chocolate? Our unofficial motto in the Hollingsworth household seems to be ‘if in doubt, chocolate’ – both Mr H and I are long-standing chocoholics (we think it’s genetic, my dad and his mum are both of a similar disposition so we must have inherited the chocolate gene) and rarely a day goes by when we don’t both indulge in a little cacao (raw of course). So now that Easter (an event high up on any chocolate lover’s calendar) is fast approaching I knew it was time to get chocolatey. I wanted to make something with a truffley chocolately centre and I also wanted to experiment with dark and white chocolate so these truffles are basically the amalgamation of everything I dreamed up! They’re honestly just the most divine things ever, and I promise you even the biggest of sugar addicts will love them, despite the fact that they are completely free from refined sugar and anything remotely nasty. They’re also really simple to make, and you only need eight ingredients! For the truffle fillings, combine all the ingredients except the cacao butter and cacao nibs in a food processor and whizz until you get a smooth, gooey mixture. While this is mixing, melt the cacao butter in a bowl over a saucepan of boiling water until it is all melted. Pour the melted cacao butter into the food processor and blend for another 30 seconds or so, until it is all mixed in. Spoon the mixture into a bowl and stir in the cacao nibs. Place the bowl in the freezer for 10 minutes, so that it hardens enough to be able to form it into balls. Remove from the freezer and shape into smallish balls. Pop them back in the freezer to set. For the dark and white chocolate coatings, melt the cacao butter for each in a bowl over a saucepan of boiling water, then stir in the other ingredients. 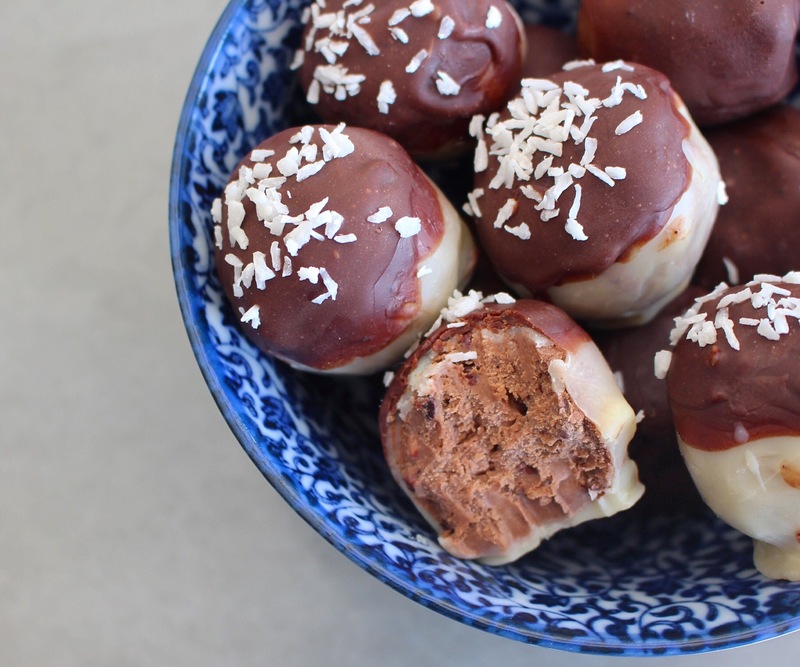 Remove the truffles from the freezer and dip them in the melted white and dark chocolate – the more times the better! Pop them in the fridge for ten minutes to set then enjoy!